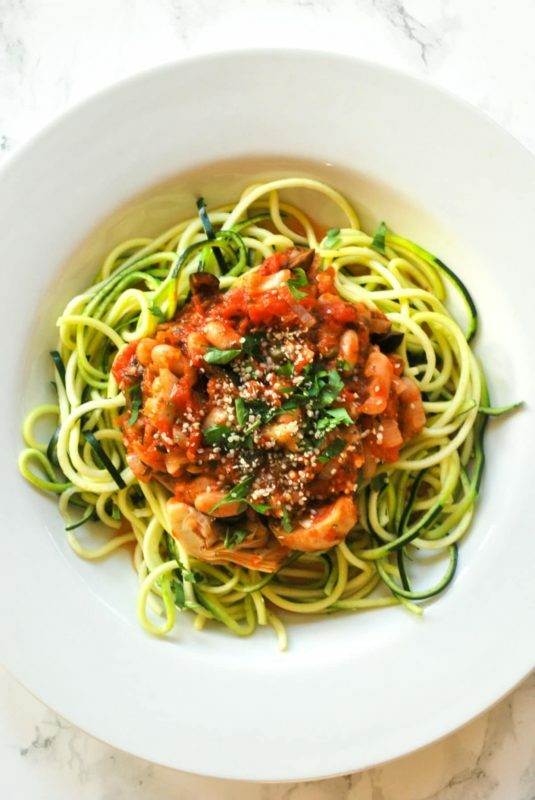 You’re spiralizer is not just for zucchini! I’ve got 21 delicious gluten free, paleo, keto, vegan, and Whole30 recipes using spiralized vegetables including zucchini, squash, carrots, sweet potatoes, and more. 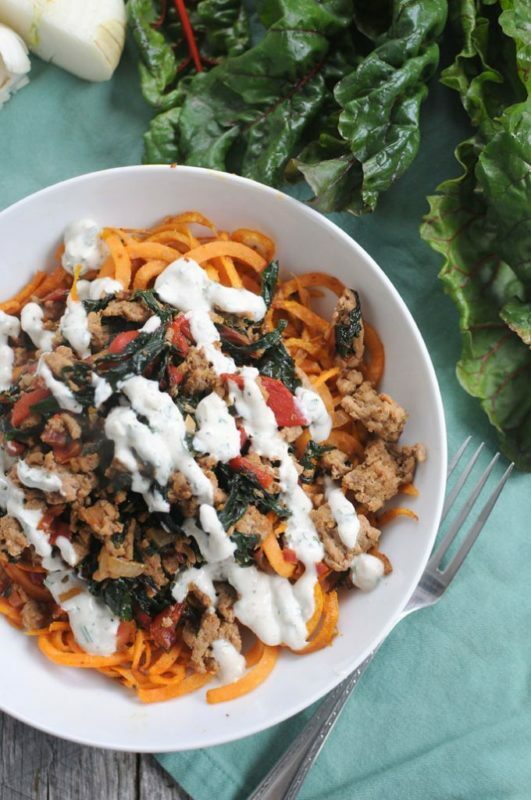 These spiralizer recipes are exactly what you’re looking for this spring and summer! Finally y’all – the weather is warming up outside and you know what that means, right? That means it’s time to break out those lighter recipes! It’s time to start making new recipes that have spring and summer vegetables. Spiralizing is one of the best ways to get vegetables into your diet. 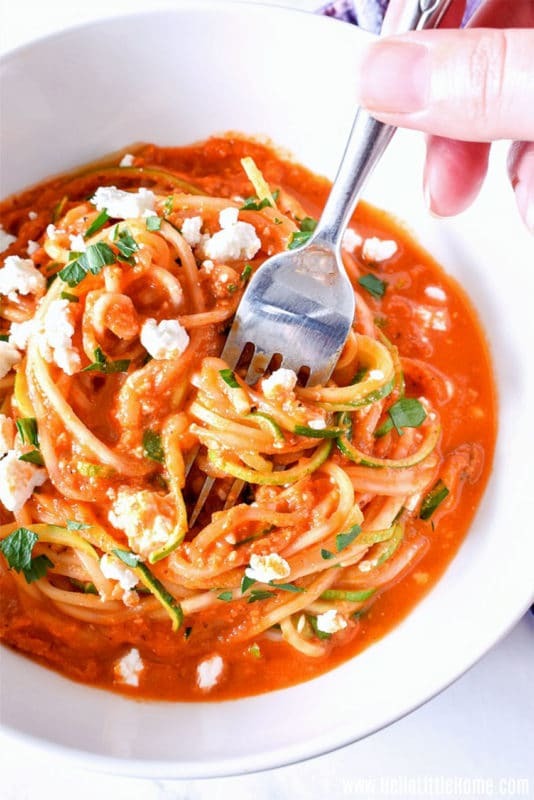 If you’re looking to limit your carb intake or add some new texture to your meals…you’re going to love these spiralizer recipes. 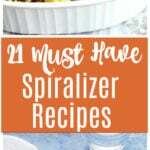 But before we jump into these 21 spiralizer recipes you absolutely MUST make…let’s take a look at what types of vegetables you can spiral. What Vegetables Can I Spiral? Did you know you could spiral all those vegetables? Amazing, right?!?! What Spiralizer Should You Buy? Let me go ahead and prepare you…there are lots of spiralizers out there to choose from so do your research and make sure you buy the spiralizer that best fits your needs. Here’s the ones I’ve seen and recommend. Spiralizer 5-Blade Vegetable Slicer – I highly recommend this spiralizer. It’s super strong and sturdy and comes with 5 stainless steel blades. Lifestyle Dynamics Original SpiraLife Spiralizer Vegetable Slicer – Do you ever get mush when you try to spiralize vegetables? Well, it won’t happen with this spiralizer. This spiralizer has a shorter and wider funnel that helps prevent mushy zoodles. Paderno World Cuisine 3-Blade Vegetable Slicer – This slicer has 3 blades for vegetable strands & zucchini noodles. Spiralizer Ultimate 7 Strongest-and-Heaviest Duty Vegetable Slicer – Are you looking to make a lot of different spiral shapes with your vegetables? If so, then this is the blade for you! This spiralizer has 7 blades and it’s super strong. It also comes with an extra blade caddy. Paderno World Cuisine 4-Blade Folding Vegetable Slicer – You can easily slice and spiralize lots of fruits & vegetables with this one. With this spiralizer, you get 1 Vegetable spiralizer / slicer plus 4 blades: 1 x Straight blade (1/8″) for ribbons and accordion cuts, 3 x Julienne blades (1/8″, 1/4″ & 3/32″) for vegetable strands & zucchini noodles. KitchenAid KSM1APC Spiralizer Attachment – Do you have a KitchenAid? If so then you’ll love this spiral attachment! This one is higher in price so if you buy this attachment, make sure you check your model to ensure it will fit. Paderno World Cuisine 3-Blade Vegetable Slicer – This one can be mounted on your counter and has 3 blades. This one has 4 powerful suction feet so you don’t have to hold down the spiralizer while spiralizing your vegetables. Regardless of what type of spiralizer you end of buying, spiralizing vegetables is super easy. And if you’re looking for a beginner’s guide to spiralizing, take a look at what Lisa Bryan demonstrates here at Downshiftology. What Recipes Can I Make Using a Spiralizer? 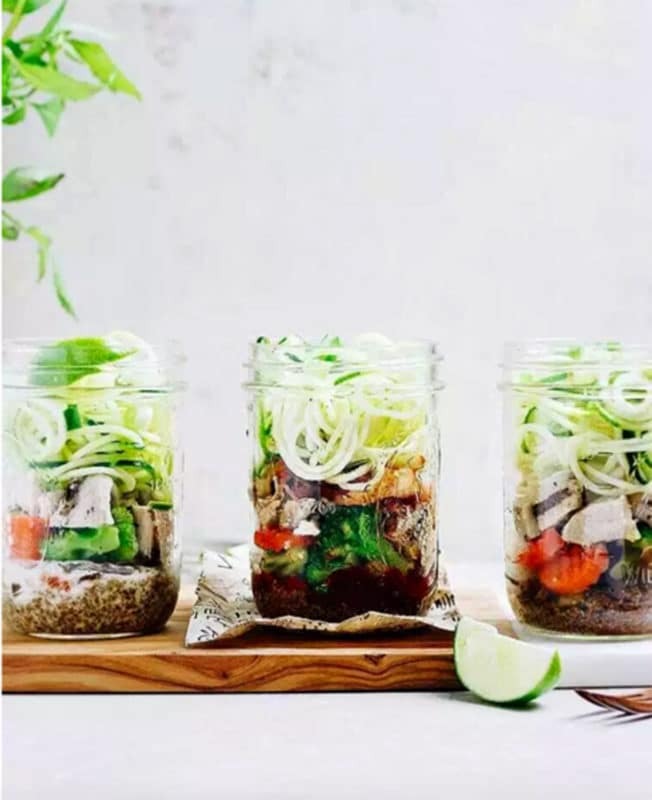 Now that you know a little bit more about what vegetables you can spiralize and what spiralizers are out there for purchase, let’s jump into these must have recipes! Spiralized beets and parsnips tossed with toasted pecans, dried cranberries, blue cheese crumbles and balsamic vinegar make this roasted winter root vegetable salad an explosion of seasonal flavors. Sage and rosemary bring forth the flavor in this hearty spiralizer recipe. A meatless pasta with a healthy twist. 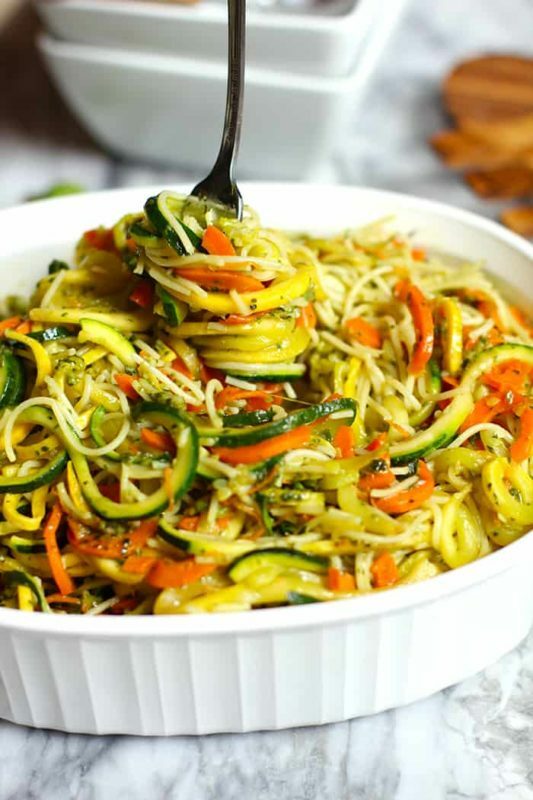 This recipe is made with spiralized carrots, squash, and zucchini. And…it’s also made with angel hair pasta. The combination of the spiralizer vegetables, pasta and pesto sauce provides a ton of mouthwatering flavor. 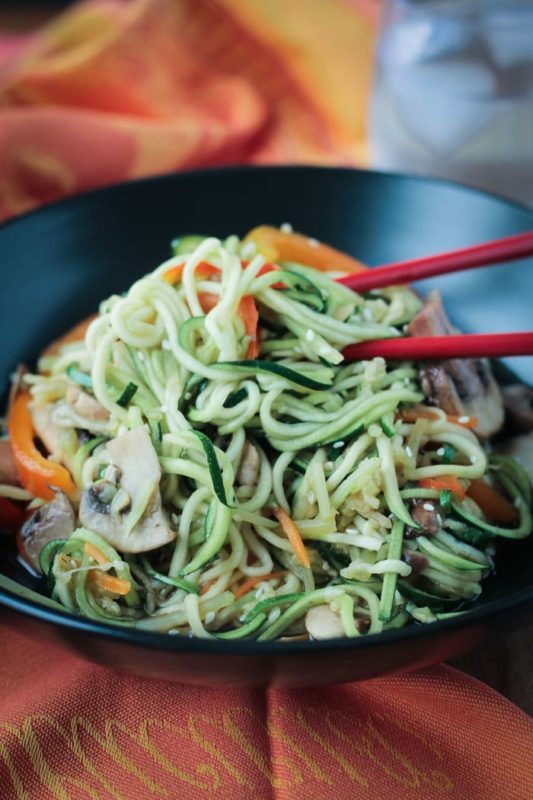 This zucchini spiralizer recipe is not only full of Asian flare, it’s both vegan and gluten free. We’re talking super quick and easy to make, low carb, and flavorful. Perfect for lunch or a light dinner and this zoodle recipe is oil free. 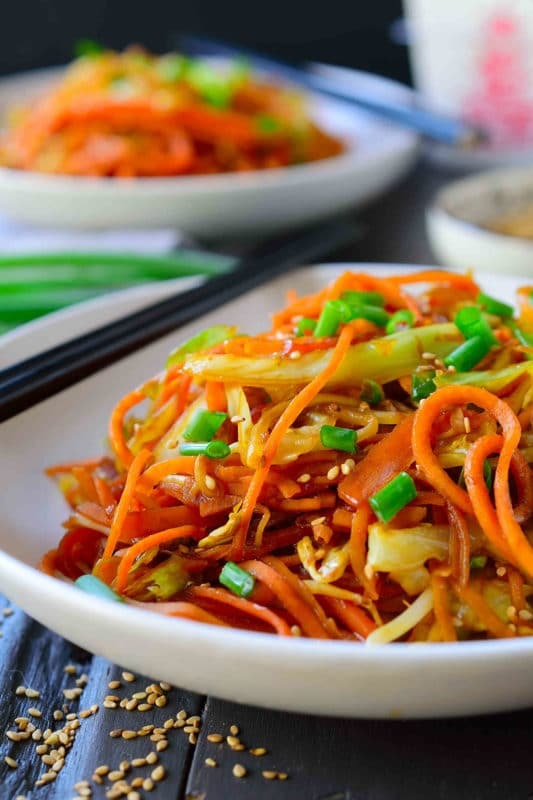 Spiralized sweet potatoes are lightly stir-fried until crisp-tender and then tossed with stir-fried cabbage and carrots and a soy sauce-sesame dressing. 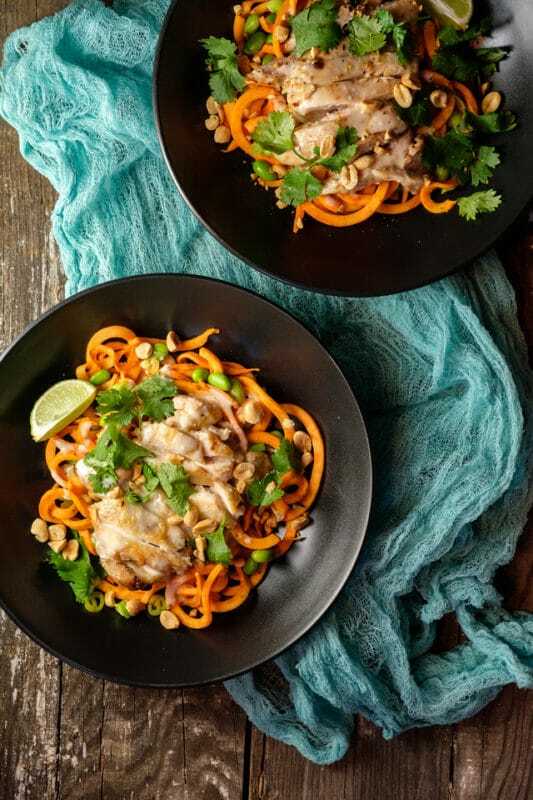 These chow mein sweet potato spiralizer noodles are a healthy, super quick 15-minute meal. 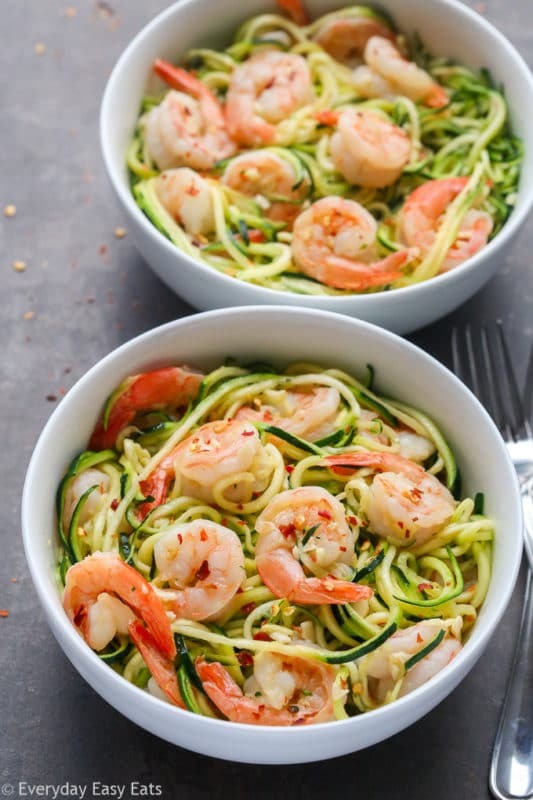 This is a healthy spiralizer recipe is made with zucchini and shrimp. Ideal for anyone following a keto, low carb or gluten free diet. This shrimp zoodle recipe is bursting with amazing buttery lemon garlic flavor and is perfect for meal prep. Ready in just 15 minutes! Who loves bruschetta? This is the healthiest version I’ve ever seen. This spiralizer recipe is Paleo, Whole 30, gluten and dairy free. 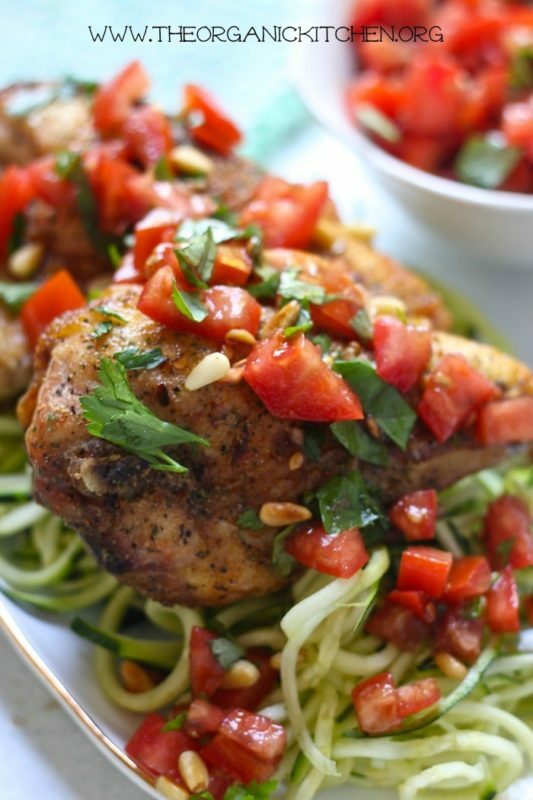 Spiralized zucchini is the star ingredient in this dish. A simple, delicious meal that can be made in the oven or on the grill! There are so many variations of Alfredo sauce recipes, so do you really need another one? Yes, actually you do. This alfredo sauce is a light version of your typical alfredo due to its almond milk base. And…it’s gluten free because you use arrowroot instead of flour. Such a healthy zoodle recipe! For those of you who don’t have a vegetable spiralizer or if you just don’t feel like breaking out the vegetable spiralizer…you’re going to love this recipe. Did you know you can buy pre-spiralized veggies at the store? Green Giant sells spiral beets, carrots, butternut squash, and zucchini. Easy, healthy and, fast recipe. We’re talking avocado, garlic, lemon juice, and fresh basil. And check out the versatility of the toppings for this dish. In case you didn’t know, zucchini is also referred to as “courgetti” in British English. 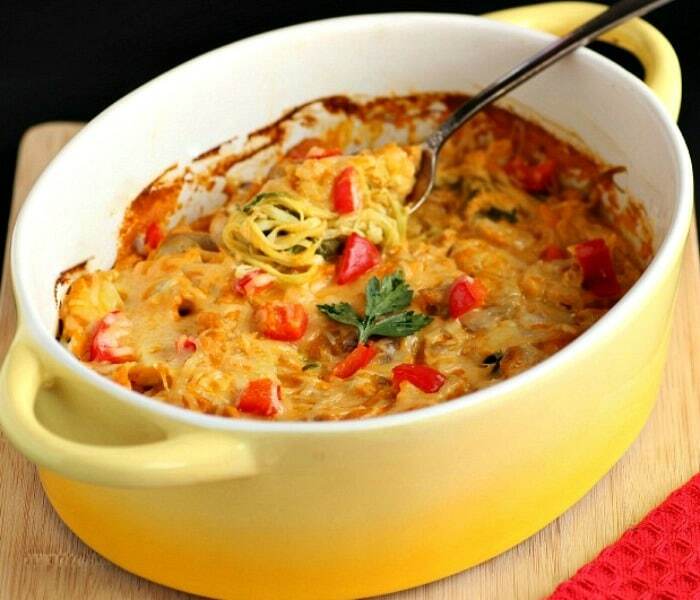 This zoodle recipe is paleo, low carb, vegan, and gluten free. 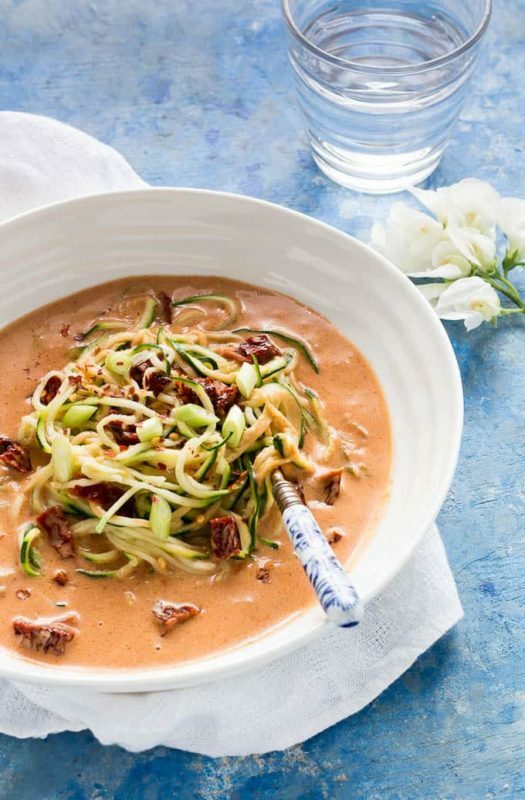 Made with coconut milk and sundried tomatoes, this easy zoodle recipe is a tasty low carb recipe that is perfect for a quick weeknight dinner. Ginger, clove, red curry, coconut milk and sundried tomatoes make up this tasty meal. If you’re looking for a vegetable spiralizer recipe with chicken, you’re going to love this one. Not only super tasty but super beautiful! 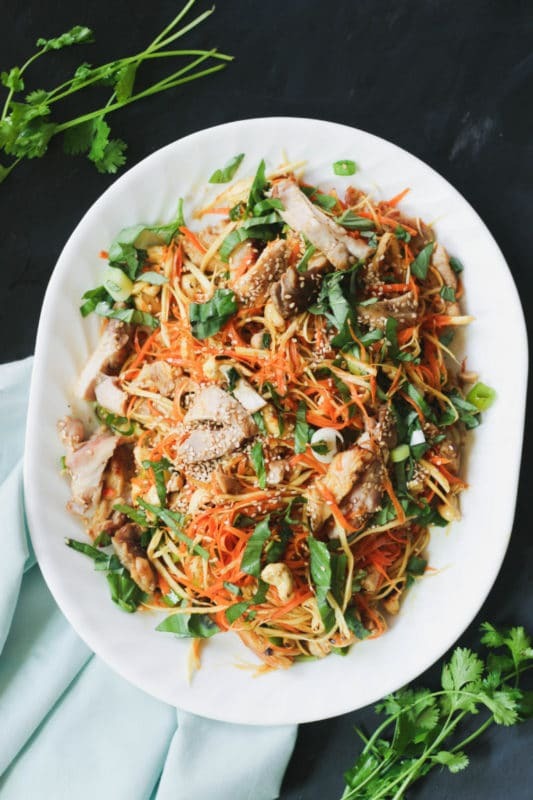 This spiralizer salad recipes is paleo and features both parsnip and carrots spiraled into thin noodle-like strips. It’s a refreshing salad that is perfect for both lunch or dinner. Low carb, high protein and full of healthy fat. Puttanesca is an Italian pasta dish and typically include tomatoes, olive oil, anchovies, olives, capers and garlic. 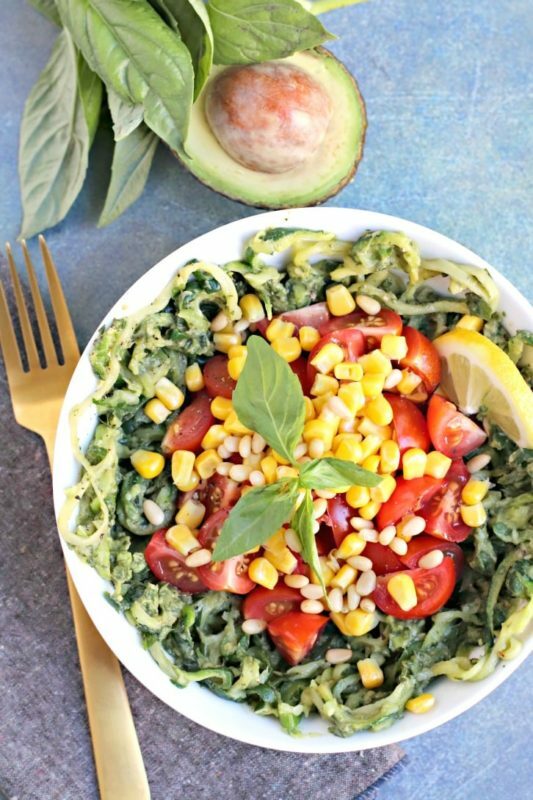 But I’m loving the vegan spin on this zucchini zoodle recipe. It’s an easy vegan spiralizer recipe that includes garlic, capers, oregano, tomatoes, white beans and artichoke hearts. Healthy has never been so delicious. You don’t see a lot of spiralizer recipes for sweet potatoes, but this one is super low maintenance. This miso marinated chicken rests upon sweet potato zoodles and edamame with a miso coconut dressing. 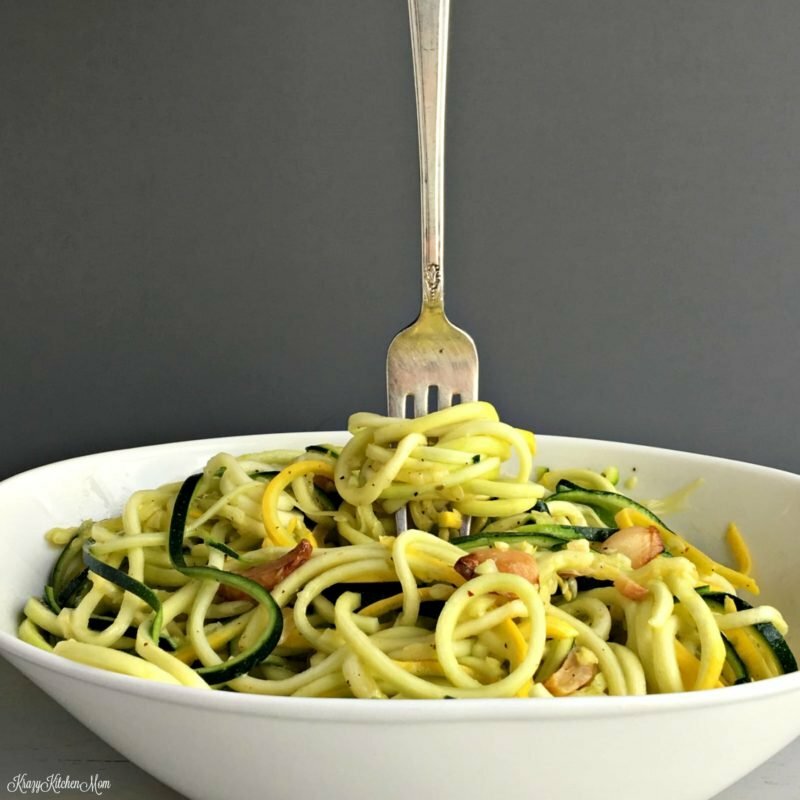 Loving this vegetable spiralizer recipes because it’s grain free, primal, low carb, and it has a paleo option. With this zoodle bake. I want you to think about a mix between buffalo chicken with cheesy macaroni. But this is the low cal version. The ingredients are amazing…butternut squash puree, ground mustard spice, ghee, and red pepper sauce. 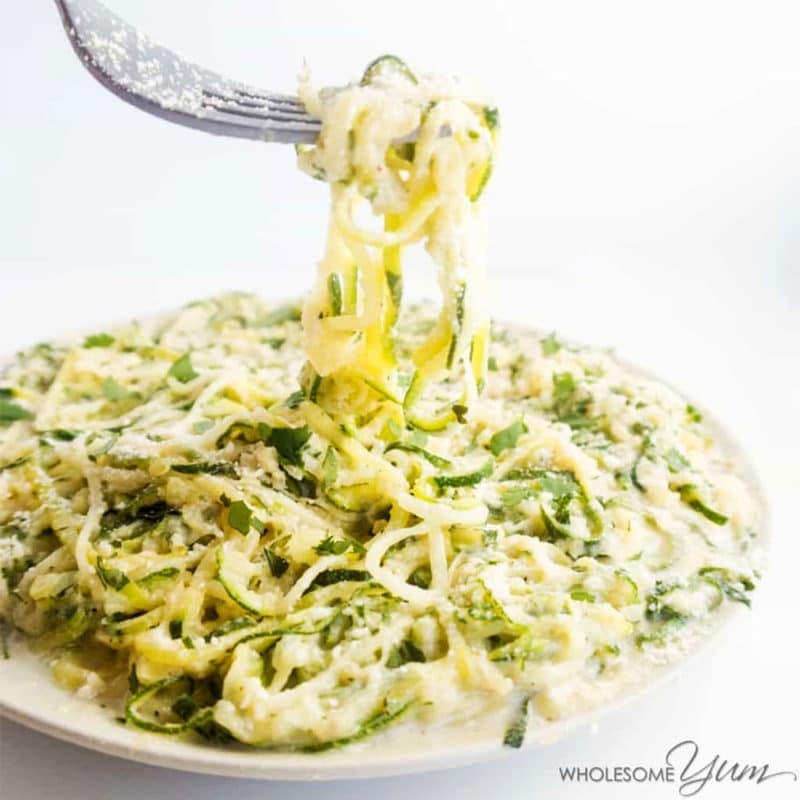 A keto spiralizer recipe made with zucchini in a creamy white clam sauce. 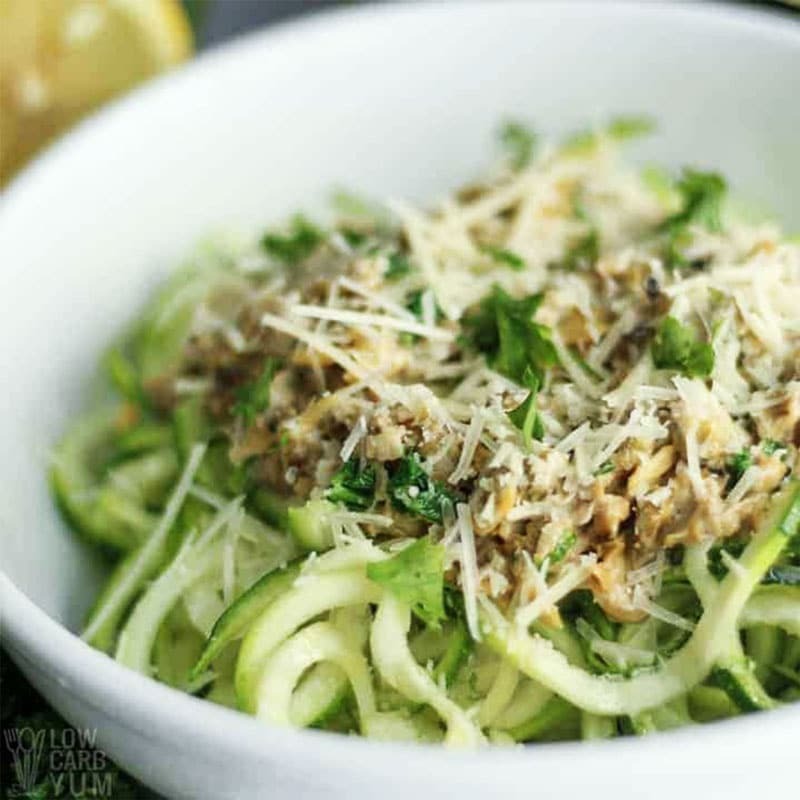 It’s the perfect way to top off low carb zucchini noodles. With a splash of white wine, garlic, cream, and clam sauce, this dish makes for an amazing dinner. A super saucy recipe that is easy to make. This Spanish based sauce contains roasted red peppers and almonds and has a hint of smoky flavor. Who loves cup noodles? This dish is Asian inspired Paleo cuisine at its finest. This vegetable spiralizer recipe is rockin 3 flavors: Umami chicken ‘miso’, Spicy kimchi, and creamy Thai coconut curry. To make this, you just add hot water, stir, and enjoy! This vegetable spiralizer recipe is paleo, low carb and keto. 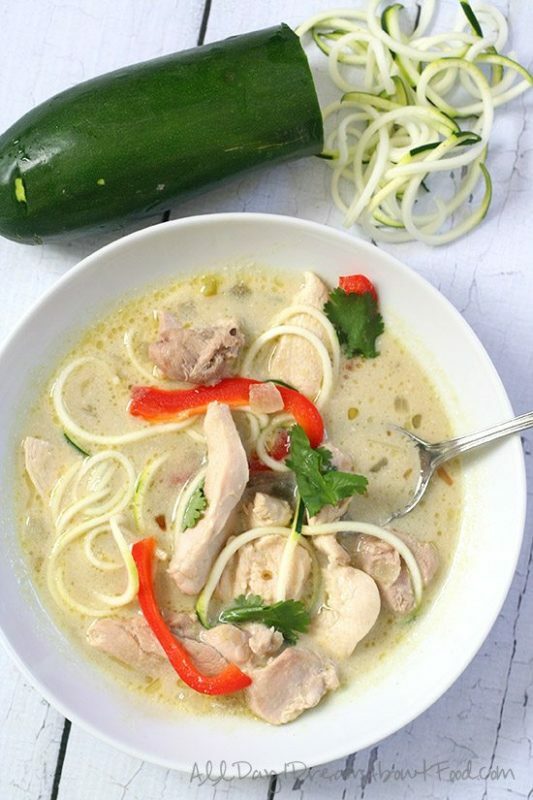 Thai Chicken Soup with Zucchini Noodles is a comforting recipe that easy to make and only takes 20 minutes from start to finish! Ingredients include green curry paste, coconut milk, cilantro, and jalapeno. 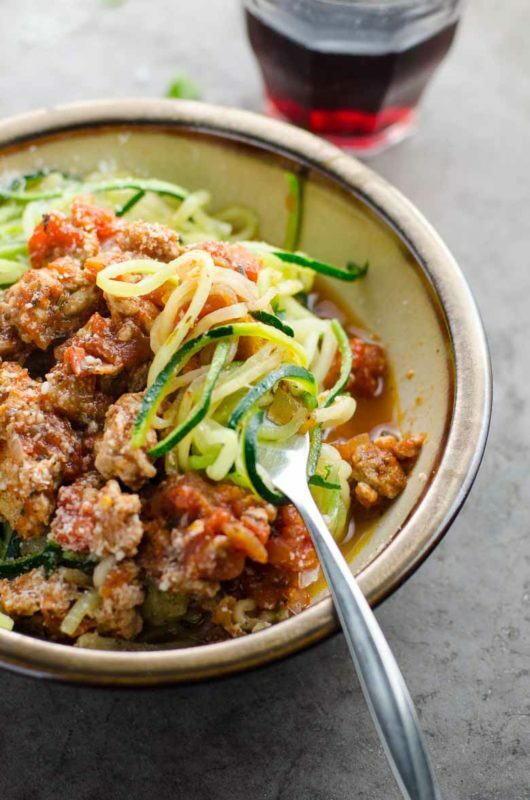 Turkey bolognese is another top-notch way to dress zucchini noodles. Made with tomatoes, basil, thyme and oregano, this spiralizer recipe reminds me of a good ole traditional spaghetti recipe. Only with zoodles. No one has time for boring spiralizer recipes. That’s why you’re going to love this zucchini and yellow squash zoodle salad! It’s a perfect side dish and it’s made with roasted garlic and a lemon vinaigrette. Want some protein? Just add some shredded chicken! Both vegan and gluten free, this spiralizer recipe is refreshing, light, healthy and easy to make. 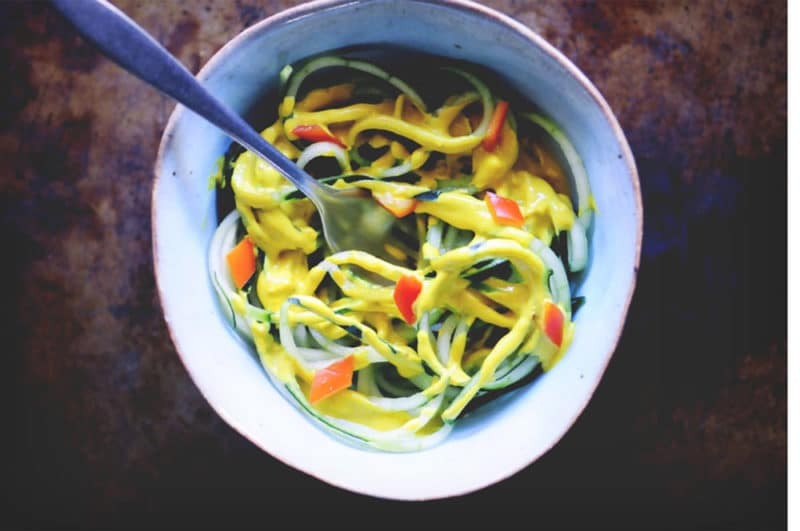 This spiralized cucumber noodle dish is served alongside a spicy turmeric tahini sauce and garnished with bell pepper for a delightful crunch. A quick and easy Spiralizer Vegetable recipe made with sweet potato noodles and topped with a refreshing yogurt sauce. This zoodle bowl is full of amazing flavors! So many scrumptious vegetable spiralizer recipes and I hope you are now inspired to make some new dishes! I feel the spiralizer is a kitchen tool that often get ignored but I’m here to tell you that the spiralizer brings so much character to your meals! So pull out that spiralizer and get to cooking because you have some amazing meals to make!! If you make any of these spiralizer recipes, snap a picture of your finished dish and share it with me on Instagram using the hashtag #recipesworthrepeating and tagging me @recipesworthrepeating.Also, leave me a comment below!